Our experiment was two experiments in one. We tested to find out how much potential energy it would take to crack the screen. From there, we tried our prototype and applied the minimum force to see if the damage was lessened. If there was no damage with the prototype but there was damage without it, it would mean that the prototype increased the amount of downward force the screen could withstand. While there are many different ways a phone could be dropped, we tested a face-down drop because, using our method, it was the easiest way to control enough variables to do a valid test. 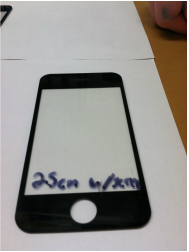 Another important thing to mention is that while our product would go under the glass screen, this was too difficult to do with our prototype so the prototype used in the experiment is on top of the glass. 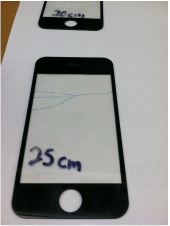 Problem: How many joules of potential energy does it take to break the screen of an iPhone and will adding our Kevlar prototype reduce the damage? Hypothesis: If we find the minimum amount of joules needed to break the phone screen and add the Kevlar prototype, then there will be less damage to the iPhone because the design of the web and the composition of the material with absorb shock by distributing the force of impact. Dependent Variable: The amount of damage to the phone. 1. Attach the clamps to the stand. The bottom of the first clamp should be 12cm above the ground. The bottom of the second clamp should be 41cm above the ground. 2. Attach the tube to both of the clamps. Be sure that the distance from the tube to the stand is the same all the way down throughout the test. 3. Sand down the bottom of the dowel to create a slightly tapered end. Sand down one edge then the opposite edge, then the two edges left to create a 1cm by 1cm square at the bottom of the dowel. 4. Use a balance to weigh the dowel. Then add weights to the top to make the total mass 917.0g. Be sure to take into consideration the weight of the tape being used to attach the weights. Use digital balance to mass the tape. Wire can be used to add small amounts of weight to get to 917.0g. 5. Hold the dowel next to the tube and raise it so the bottom is 20cm off the ground. Make a mark on the dowel where the tube ends. Label with 20cm, making marks and labeling every 5cm until you reach 65cm from the ground. 7. Place a phone face up on the wood. 8. Find the center of the phone and place the coin over it and position it so the dowel comes down onto the middle of the coin. 9. Measure the height of the phone and subtract from the number of centimeters the dowel starts from the ground. This will be used later for calculations. 10. Bring the dowel up so that the mark labeled 20cm is level with the top of the tube and then release the dowel and let it fall onto the phone. 11. 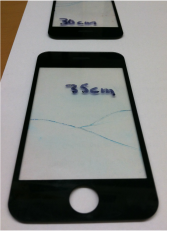 Record the damage done to the phone, quality and quantity of any cracks, if possible, label with 20cm and take a picture for side by side comparison with tests. 12. Repeat steps 7-10 for each increment of distance marked on the dowel and record the results. 13. Use the loom to weave a web using Kevlar. Tie a double knot around one tooth and bring the strand across to the took exactly across from the first one. Then bring the strand around the third tooth from the tooth with the knot. Continue this pattern until you have looped around all the teeth and then tie it off at the end. 14. Place a phone in the center of the web, still on the loom. 15. Place a piece of tape on each side of the phone but not touching the phone. 16. Flip the loom over and repeat the previous step on the other side so the web is stuck by the tape on all sides of the phone. 19. Conduct the test again at the first height which caused the phone to break. PEgrav= mass(kg) x gravity x height(m). We measured in centimeters but then subtracted 0.08 cm, the thickness of the phone, so that we knew the exact distance from the start of the drop to the surface. One crack beginning in the middle of the left side and splitting at the middle of the screen and becoming two cracks with approximately 45 degrees between them. We found that our hypothesis is true. When we found the minimum height where the screen would crack and then dropped the dowel again on a screen with the Kevlar prototype the screen would sustain less damage because the web would distribute the forces over the entire screen. In this case, it prevented it from cracking altogether. When we increased the height of the dowel, by 5 cm for each trial, the damage increased slightly with each trial. The first trial yielded no damage to the screen while the following trials all did. The trial using the Kevlar also did not result in cracking to the screen. We were only able to test on five phones due to limited resources but ideally we would have liked to run two or three more sets of tests to insure accuracy as well as conduct more tests using the prototype with different amounts of force. We were only able to test one phone with the Kevlar but we would have liked to test on more for more comparisons if our resources allowed. We made sure to control the type of phone, the location of impact, and the weight of the dowel. We were not able to control all the variables. Some of the variables that were not controlled were the slight friction between the dowel and the tube, and the fact that where was a lot of duct tape on the phone when we attached the prototype. The design of the prototype used in the test is not the same design as the prototype used for our display. While this may cause the results to change if we used a spider web pattern it, is made of the same material so the results will not be altered dramatically. This is another variable we would have to account for if we were to test our prototype; whether the material is what is most effective in preventing damage or the structure, the amount of material used, or a combination of all these things. Also, for our tests, we used the same phone but replaced the screen. 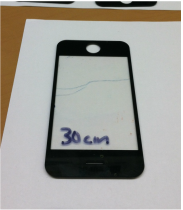 However to easily do this, we cut out a few parts inside the phone so it slid in easier. This might have affected how the impact was absorbed by the phone. In addition, the dowel underwent a bit of wear from repeated impact with the wood. In the process, our biggest problem was finding a weight that would break the phone, but not too much that it broke it every time because we wanted to find out the minimum height. We started with the wooden dowel and then switched to the metal one. The metal one was too heavy and broke the screen no matter what. So we went back to the wooden dowel with more weight. However, since the metal was more similar a force to actually dropping the phone, we put a coin on the surface of the phone so it was still being impacted by the metal.